What if God&#8217;s love were like the sun, constant and unchanging? What if one day you realized nothing could take that away? Firebird is a bright orange baby Oriole who just loves the sunshine. But whenever a storm blows in, he frets and asks Mama why God allows the rain to take the sun away. When Firebird is finally old enough, his mother gently instructs him to fly up through the thunder and lightning to see what&#8217;s on the other side. It&#8217;s a rough flight and just when he&#8217;s about to give up, Firebird rises above the storm to discover the sun shining where it always had been. 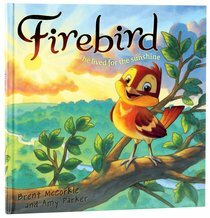 Firebird is a children&#8217;s book that parallels the life of Samantha Crawford, a storybook artist in the inspirational film Unconditional, who lost sight of God&#8217;s love and discovered it again. Brent McCorkle wrote and directed the film "Unconditional". His previous movie, "The Rift", a metaphoric story about adoption, was a winner in The Doorpost Film Project 2009. Brent and his wife have five children. Parker is Principal Lecturer in English at the University of Central Lancashire. Rob Corley is a veteran animator with Disney, San Marco Films, and Curious Pictures. Rob is also the cofounder Funnypages Productions, an animation development and illustration company, and Funnypages Press, a comic book publisher. Beautiful story of God's steadfastness despite circumstances. Quickly engaging with a relatable story and lovely illustrations. Accessible for very young children, but still appropriate for older children. A great story book to reinforce an important concept and characteristic of God. Beautiful story about God's faithfulness through the storms of life. Lovely to read out loud. Beautiful illustrations. Highly recommend. Wonderful lesson - even for adults! Captivating story about a gorgeous little bird! This story arrived in our house on just the right day, being used after dinner that night to share some truths about when life feels a little "stormy". Our kids really held onto the lesson, and the book has become a firm favourite. This is an engaging little story that speaks so much wisdom and insight into the character and activity of God - especially in tough times. That's a big call - but this book is my number 1 choice when giving gifts to other little kids.